Honeymoon Part III: This man I love. After four and a half years of dating, you have almost spent so much time anticipating being married, that it is weird to have that anticipation removed and actually get married. Anyway, when I picked him up at the airport a couple days before the wedding, I was thrilled, but also kind of nervous. I had been so busy planning this event, and now the main part of it was there and he seemed just a little like a stranger from it, like a stranger, from me after the last two months. In the weekend to come, I only saw him alone a handful of times. The day before the wedding, we stole some super romantic one-on-one time for me to drive him, both of us dirty and sweaty after setting up the reception site, to where he was staying. We decided that getting married gives you that feeling in your stomach like getting on a huge roller coaster, the scary kind (the kind that I didn’t do till I was 15). You are excited when you get in line. But then the longer you wait, the scarier it looks, and the higher it feels. Finally, you get up to the front and a part of you – a small part – just wants to jump out of line, even though you know that it will be fun if you can just let them lower that bar over your head. Because from that point, there is no backing out and you just have to hang on and laugh. 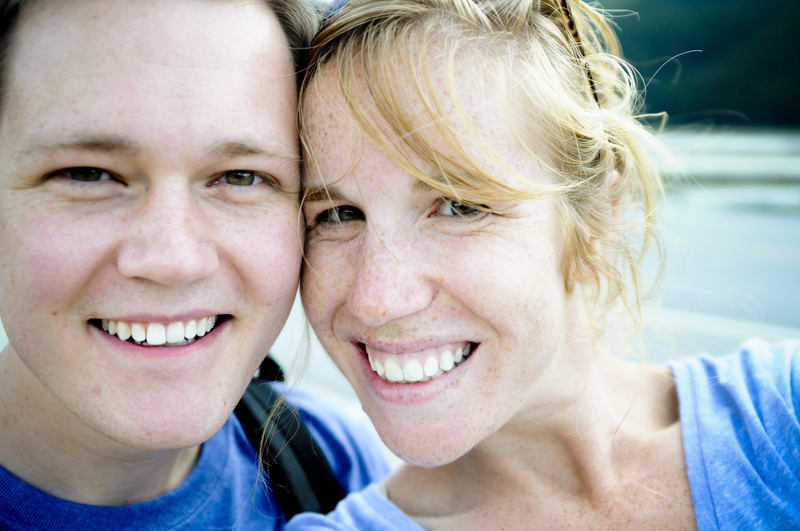 On our honeymoon, I was able to realize afresh that I had married my best friend. I was able to spend time with him for the first time in months without talking about pocket squares or invites or flowers. I was able to laugh with him as we intentionally scanned the satellite radio looking for “Call Me Maybe” so that we could sing aloud at the top of our lungs. I was able to joke with him about the fun things we are doing now that we will absolutely not let our kids do, like paying to ride up the sweet gondola to the top of the mountain instead of hiking it. And that pre-roller coaster feeling was gone, replaced by giddiness that we have a long, long ride in front of us. And coming back from our honeymoon, we really came back as JamesandHannah, not the James and Hannah that we were when we left. A family, James likes to tell me, a unit, a team. And that was the best part of the honeymoon, better than the scenery, or the colors, or the adventure. Because I came back with the certainty that this man, I love. And I will get to forever. This entry was posted in Uncategorized and tagged James, love, marriage, photography, travel, wedding. Bookmark the permalink. 36 Responses to Honeymoon Part III: This man I love. Made me cry! As per the usual. I am so happy for you both. And I love the way you describe your feelings pre and post wedding. I know I don’t have to tell y’all to enjoy the ride and not take the journey for granted. I’m just so glad I got to be a part of sending you off on that amazing journey 🙂 love you both! The happiness is mutual! “Hope realized” is the perfect description! I am so unspeakably happy that you came to celebrate with us! After seeing this post I gave James a standing ovation for his skill in taking pictures/kissing at the same time. What a guy! May your online presence be ever validated. He is indeed a talented multi-tasker! And thank you ; ). well, i’m commenting partially because i saw what you wrote on facebook and fear that you’ll actually stop this delightful blogging streak (don’t do it! keep it coming! ), and partially because this was such a beautiful post. i truly enjoy reading your thoughts on life and love and weddings and marriage, and so many other things. i never feel like you’ve just had this random thought bubble up and you run to the computer to share it with the entire universe. if that IS actually the case, and I’m mistaken, your thoughts must start interesting, and get to brilliant in a millisecond. you make me want to sit and ponder life for hours. oh if only i had the time! maybe, with practice, I can have brilliant thoughts in a millisecond, too. : ) james is quite a fortunate man to have landed such a wife. Thanks Mary! I actually just like it when people comment here because then I can actually respond to each person’s comment individually. And I do tryyy to only post when I have something to say… glad it works! As for having more time… I am constantly amazed that you manage to raise two adorable little ones, blog, and still manage to look cute in all the pictures I see. All of the Strecker men are lucky to have such a woman in their midst! It is very lovely to see new love sprout and grow! The good news is you will get to have many years of remaking your marriage over and over again. My hope for you is that through the years ahead and the many transitions life will bring that you will remember and renew this feeling! And yes, please keep blogging… better yet I hope there is a book in the making here, we all need a new Nora in our lives! Thanks Tina! It was so nice to have some of the more “seasoned” couples that I respect there with us at the start! Once again, I will remind you to make certain this blog exists somewhere for eternity, so you can reread these thoughts and keep them near and dear to you, which you will certainly need when you have been up for three days with a child with a horrific ear infection, when you are both sick and there is no food in the house, when your spouse ruins the car you have finally paid off, when you are of two very different minds about how to handle teenage angst, when….well, you get the idea, when life hands you all the problems it will. But when you have a loving spouse, somehow you get through these things, because having a loving spouse is like winning the lottery! 25 years for us this November! I delight in reading your thoughts, and wish you and James all the best! Prof Bushey, your comment made me laugh so much! And it was partially the funny laugh, and partially the nervous laugh because I know you are right and it will get harder, but hopefully we can look back and remember these blissful times during the tough times. ” I was able to spend time with him for the first time in months without talking about pocket squares or invites or flowers.” haha YES. I am enjoying your recent blog posts so much! Don’t stop! It’s funny to think of just the two of you as a complete family, isn’t it? It seems like there needs to be more than two to count as a family. But it’s true. You are now more Together than anyone else in the world. It’s a lovely feeling. It is indeed, and it is lovely. Of course, your family of two is now getting a little bigger and that is VERY lovely!!!!! You described a lot of what Andrew and I went through since we spent our engagement year with me in Colorado and him in D.C. He tried to help out where he could with the wedding but really had no clue what was going on and kept having to ask me questions. Haha! And you are right, it is strange all of a sudden being with your now husband after having been apart from for so long. Glad to hear that your honeymoon was a “falling in love all over again time”. It only gets better from here! That’s right…. and you all had such a LONG engagement, which probably made the waiting-in-line feeling even worse. Looking forward to the many years ahead! Hannah, this is truly beautiful. Just lovely. And your pictures are incredible. Thank you for sharing! I am so happy for you and James! Marriage truly is the greatest gift, isn’t it?! It is the greatest gift!!! I can’t wait to get pictures from the day because I have high hopes that they will be as stunning as yours!!! Thanks! I am back to grad school this week so it was so nice to have a little down time after the crazy! This was such a beautiful post! My feelings almost exactly echo yours. Things did get kinda scary the closer the wedding approached. I felt like the details of the wedding got in the way of our relationship, and we didn’t get to see each other very often at all. Like you, I wondered if we had become strangers. Now we are having a ball. There have been ups and downs, but the journey is filled with those little special moments that make life magical. Congrats again, Hannah. And by the way, your Honeymoon pictures are gorgeous! It makes me want to go to Canada someday. Exactly! And I must say that I looked at some of your photos and they are so perfect! Congrats! What awesome thoughts, Hannah, and so beautifully written! I agree with Mary that James has found quite a catch! I am so very happy for you both. Speaking of nice color combinations, I love the complementary color pic with your orange hair and James’ blue shirt! Thanks for noticing ; )… you are a kindred color spirit. When are you and Ryan and that precious meatball finally moving to DC??? It will be in late June or early July of next year. We are currently in a UHaul, traveling the last day of a four day drive to Portland, Oregon! We can’t wait to see our new place! And then of course we’ll be making the even bigger trip from Portland to D.C. only 10 months from now! So crazy, but oh so fun! I love the roller coaster analogy. I think it’s true. And I can’t wait until I don’t have to wait in line anymore. And I really like you and this posting-every-day thing. Just found these posts! love the pictures! Where did you guys stay? Hi- and thanks! We stayed in Canemore (just out side of Banff– you get wayyyyy nicer and more space for your money) and I think that the place was called Stoneridge resort or lodge or something. We loved it! Sure- share away! We would come back in a heartbeat and hope to do so someday!